Rap and hip hop are typically viewed as purely American music types; however, Australia also has a thriving hip hop industry. The Hilltop Hoods are one of most well-known Aussie rap groups, followed by the Funkoars and The Vents. Formed in 1994, the Hilltop Hoods are composed of the lyricists Matthew Lambert aka “Suffa”, Daniel Smith aka “Pressure” and DJ Barry Francis aka DJ Debris. 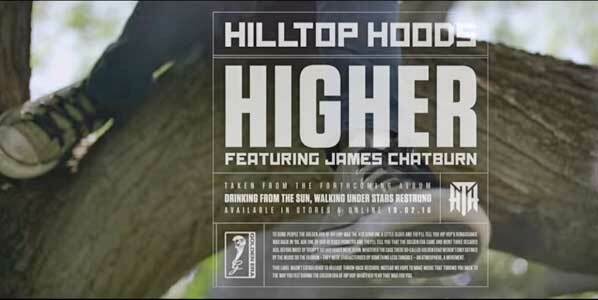 In 2015 The Hilltop Hoods in association with fellow lyricists James Chatburn, released the song “Higher” as part of the Drinking from the Sun album. “Higher” is a look into the personal lives of the main rappers in the Aussie hip hop group Hilltop Hoods. Even though DJ Debris and Chatburn are featured in the video and lyrics, the song is predominantly about Pressure and Suffa and the relationship they have with their families that is being tested with their constant rap tours. In the opening, Pressure raps the lyrics “I brought a piece of the road into the peace of our home. You the cornerstone of every bit of peace that I’ve known. But this fever to roam I can’t leave it alone.” This segment implies that while he loves his family, his constant absence is beginning to negatively affect them but in spite of this he still yearns for travel. When Suffa takes stage during the second verse, he raps “She used to say, you make me wanna run to you, I’m so proud of your accomplishments. Looked at me like I had hung the moon, now she looks at me like I’m blocking it.” This is meant to show that, even though Suffa’s wife is proud and grateful for all he’s done, she recognizes that his absence is a burden on their family. The music video features an off-white model of All Stars. The music video centers on a little girl representing the rapper’s families, and whose parents are too self-involved to notice or spend time with her. The girl appears in a pair of well-worn tan All Star high tops, with a good close up during the title sequence of the video. The All Stars appear as she sits cross-legged while drawing alone in her living room, sitting alone with a soccer ball on a bench, and alone in the hallway as her parents are too busy with work or their own interests instead of spending time with her. The girl represents the rapper’s respective families. Get yourself a new pair of chucks to enjoy your family life in by clicking on the links below.